Aircraft are the stars of the Air Tattoo and you'll find all the information about the aircraft and operators invited to participate in the 2019 show here. Due to reasons outside our control, a number of aircraft displays may appear on different days for reasons such as display team commitments. We can confirm that the Red Arrows and Spanish Navy Harrier pair are planning to fly on all three days! You can find the aircraft that attended the Air Tattoo in 2018 and previous years in our Looking Back section. Our Frequently Asked Questions page provides further information about aircraft at the Air Tattoo. Find out more about the process for inviting participants. All aircraft participation is, as always, subject to operational commitments, technical issues, crew availability, weather conditions and other factors. The full list of aircraft that are confirmed for the 2019 Air Tattoo! 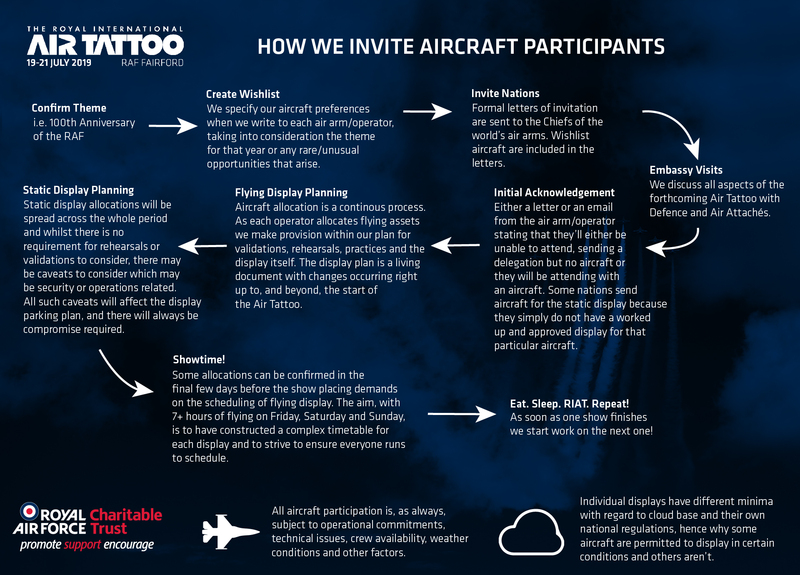 Find out who we invite to the Air Tattoo; and how we do it!